Oliver Tomlinson has been at the helm of JN Life Insurance since it began underwriting Life Insurance business in 2013. He has been working in the financial industry for the past twenty years, with managerial experience in Remittances, Foreign Exchange Trading and Life Insurance. Prior to joining the private sector, he worked as a teacher for five years, specializing in Deaf Education and the teaching of mathematics. As the head of JN Life Insurance, Mr. Tomlinson established the strategic direction and has guided the company on a profitable growth path since its commencement of business. He has guided the team at JN life to develop products designed to meet the needs of JN Life’s parent company, as well as to provide Insurance coverage for other institutions. 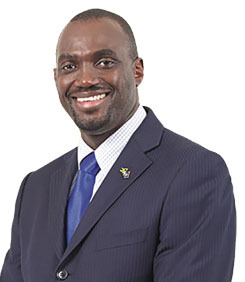 He is: Chairman of the Board of Trustees for the Jamaica Business Council for Health Awareness (JaBCHA), an executive member of the Insurance Association of Jamaica (IAJ) and a member of the Jamaica Association of Insurance and Financial Advisors (JAIFA). Mr. Tomlinson holds a Master in Business Administration from the Florida International University, a Bachelor of Science degree in Government from The University of the West Indies and a Teaching Diploma in Special Education from the MICO University College.